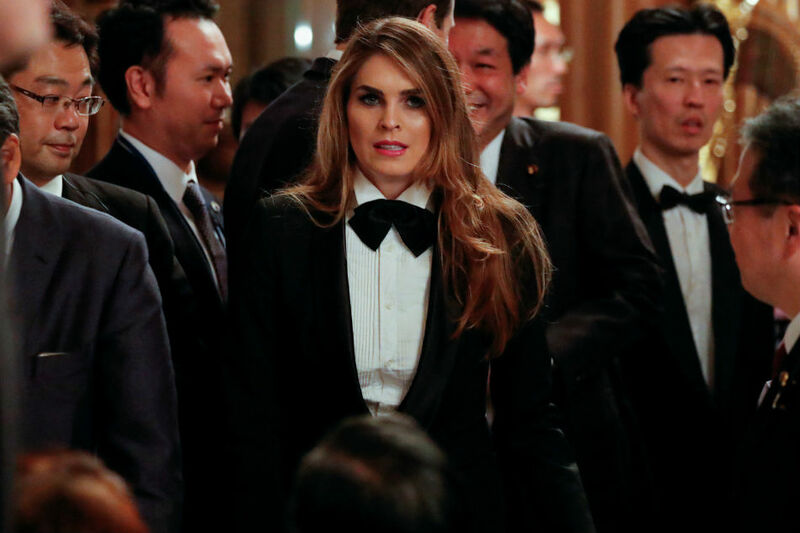 WASHINGTON - Hope Hicks, one of Donald Trump's longest-serving aides and perhaps his most trusted confidante, on Wednesday announced her resignation in the latest of a string of departures from the embattled White House. The 29-year-old former model and PR operative took her first job in politics as spokesperson for the Republican's victorious campaign, before joining him in the White House where she was named communications director last September. While she cut a discreet figure in the White House -- refusing all interviews -- the former advisor to Ivanka Trump was known around the West Wing for her close relationship with the president's family and as a keen defender of his image. She was well known to have the ear of the president, who never publicly voiced the slightest criticism of her. "There are no words to adequately express my gratitude to President Trump," the 29-year-old Hicks said in a statement on her departure. Trump paid tribute to Hicks' "outstanding" contribution over the past three years, calling her "as smart and thoughtful as they come, a truly great person." "I will miss having her by my side but when she approached me about pursuing other opportunities, I totally understood," he added. "I am sure we will work together again in the future." White House Chief of Staff John Kelly said Hicks had "served her country with great distinction." "To say that she will be missed, is an understatement," Kelly said. The White House said Hicks had informed Trump she wished to leave in order to explore other opportunities. Trump's spokeswoman Sarah Sanders said no timeline had been set for her departure. In a sign of the high turnover in Trump's administration, Hicks was the fourth person to head the communications team -- her immediate predecessor, the brash Anthony Scaramucci, having lasted just 10 headspinning days in the role. Hicks' departure follows that of a succession of senior administration figures: from national security advisor Michael Flynn, to Reince Priebus as chief of staff, Sean Spicer as press secretary and Steve Bannon as the president's chief strategist. As communications director she was responsible for shaping the administration's message, but Hicks was far less visible to the public than the press secretary Sanders, and before her Sean Spicer. But she was brutally thrust into the spotlight in early February when another top Trump aide with whom she had become romantically involved was accused of domestic abuse by an ex-wife. Former White House staff secretary Rob Porter -- who denies the claims -- resigned following the allegations. Hicks had helped craft the official response to the scandal, despite her personal involvement with Porter. Sanders denied any link between Hicks' decision to leave, and her questioning Tuesday by a congressional panel probing Russian meddling in the 2016 presidential election. During her appearance before the House Intelligence Committee, Trump's communications director had stuck to answering pre-approved questions, and refused to answer many of the other questions put to her. That meant avoiding questions about her work and White House contacts with Russia, according to lawmakers present at the closed session.